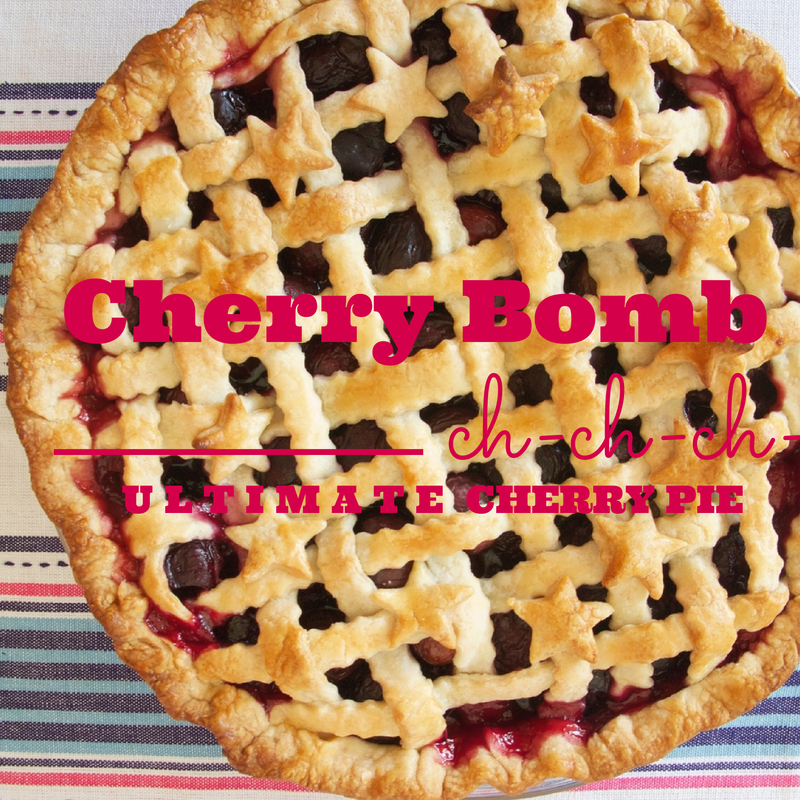 What’s the secret to making the ultimate ch-ch-ch-cherry pie? Use fresh sweet summer cherries. 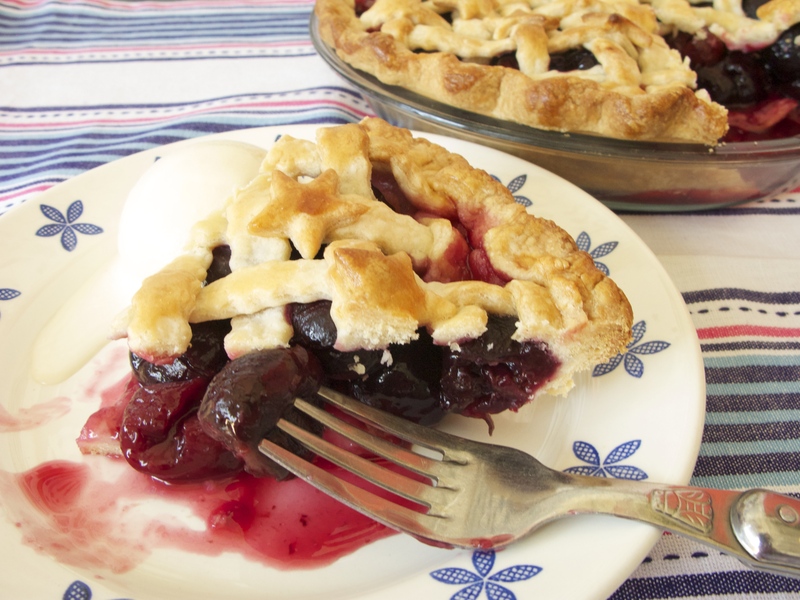 Some folks think you need sour cherries (which we seldom find fresh and are usually packed in syrup) to make a good cherry pie, but we think you’re missing out on some really great pies by sticking with canned cherries. When cherries are in season we use whatever looks the best at the market– everything from Bing to Queen Ann cherries. Make the dough as early as tomorrow and refrigerate tightly wrapped in plastic wrap. While the dough rests in the fridge the water is absorbed in the dough and the butter firms up. A properly rested and chilled dough relaxes, making it easier to roll out. 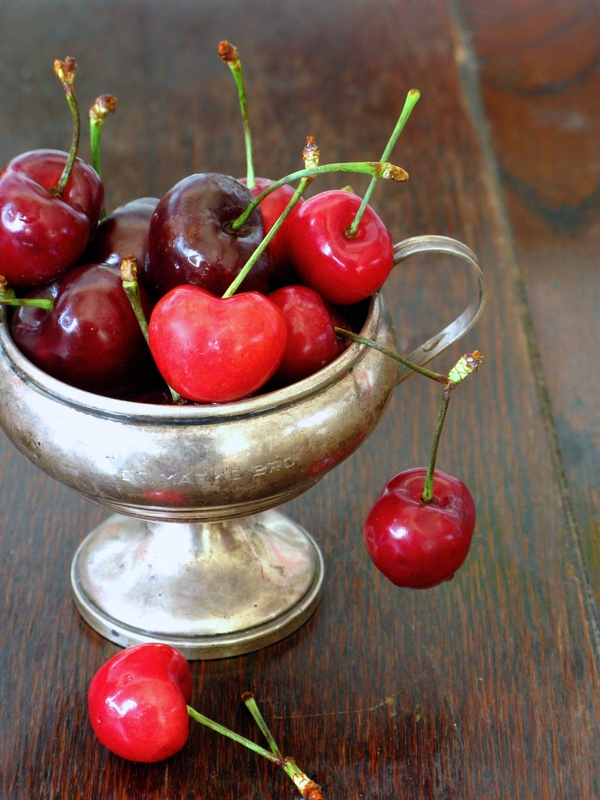 Buy an inexpensive cherry pitter. A cherry pitter makes the process go much faster! If the thought of pitting fresh cherries makes you want to poke your eye out, you can use pitted frozen cherries or bottled cherries (which are great for pie making during the winter as well.) Thaw the cherries completely and use no more than about 1/4 cup of the collected juice. Roll out half the pie dough on a lightly floured work surface with a floured rolling pin into a 12-inch round. Brush off excess flour; roll dough around rolling pin, and place it over your prepared pie pan. Press the dough into the pan and trim the edges so that the dough hangs over the pie pan by about 1-inch. Refrigerate while you make the filling. In a large bowl, add the cherries, sugar, salt, almond, kirsch, lemon juice, and cornstarch. Toss the filling ingredients with the cherries until coated . Set cherries aside while you roll out the top dough. Roll out the remaining dough to a 12-inch diameter circle. With a pastry cutter or a knife cut at least eighteen 1/2 -inch strips. Place strips on a parchment lined sheet pan and refrigerate. Cut out stars or decorations using a cookie cutter from the remaining dough scraps and refrigerate. Spoon cherry filling into the pie shell. Dot with butter. Lay strips horizontally across the pie and give the pie a quarter turn. Fold back every other strip starting with the first strip. Place a strip horizontally next to the folded strips and unfold the folded strips. Repeat the process starting with the 2nd strip folding back every other strip. Repeat folding, adding strips, and unfolding strips to weave a lattice pattern. Trim the lattice and fold the edge under or over and crimp the edge. Refrigerate the pie for 30 minutes. In a small bowl whisk the egg and cream together to make an egg wash. Brush pie with egg wash and bake for 15 minutes at 425°F. Reduce heat to 350°F and bake approximately 35 to 45 minutes more until crust is golden brown and filling bubbles. Remove pie from the oven and cool COMPLETELY (at least 2 hours) before serving. Serve with pie with a scoop of ice cream or a dollop of whipped cream. Want an easy way to remember our recipe without having to look it up again? 3 + 2 + 1! 3 parts flour 2 parts butter 1 part ice water. Place the flour in a large mixing bowl, add the chilled butter and toss to coat the butter with flour. Quickly rub the butter with the flour between your fingers to make flat pieces of butter. Take care not to overwork the butter – you want to work each piece, but should still have pea-sized lumps of the butter in the flour. Sprinkle in the salt and sugar and toss with your fingers to mix. Add the water and using a plastic scraper and a quick a folding motion, mix the dough just until it begins to clump together. The dough will look sandy and lumpy at this point and that’s okay. Turn the dough out onto a work surface dusted with flour and gently pat out the dough into a flat disk about an 1-inch thick. Fold the dough in on itself until the dough just begins to hold together and is no longer sandy on the edges. Once the dough begins to come together, fold dough in half, turn it a quarter-turn and pat it out flat again to an inch thick. Repeat this process 4 to 5 more times. Butter will still be visible in the dough — it’s these pieces of butter that result in a flaky dough! Divide the dough in half and flatten each piece into a disk one more time and wrap them in plastic wrap. Refrigerate for at least 30 minutes to an hour before rolling out. 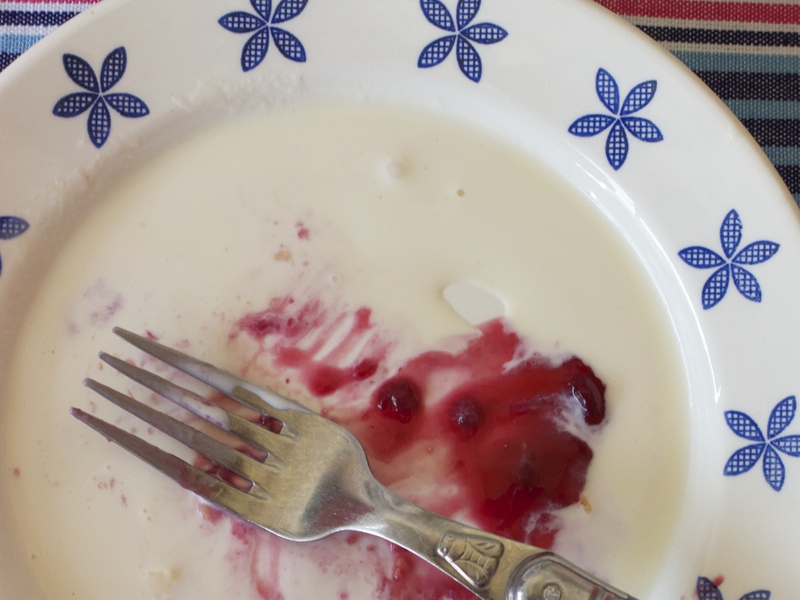 We dare you not to lick your plate! This entry was posted in How-to Videos, Recipes and tagged baking, baking tips, Cherry Pie, cherry pie video, Dear Martini, Dear Martini videos, dessert, Holiday recipes, how to make a cherry pie, how to make a lattice top crust on a pie, how to make pie dough, how to take the pit out of cherries, how-to videos, lattice crust pie, make cherry pie from scratch, pitting cherries, special occasion, video on how to make a cherry pie. Bookmark the permalink. ← Healthy Eating is a SNAP! Wow! Mia & Terri, the Cherry Pie is a-maz-ing! And your video is the bomb! The best lattice instructions ever. Wish I had a piece now… had to settle for a cherry pie Lara Bar, sigh, not even close. Happy 4th! your family stands at the ready to help with taste testing! !